Our spacious banquet facilities can accommodate groups from 50 to 1,500 and is connected to the area’s Best Casino* the Isle Casino Hotel® Bettendorf. 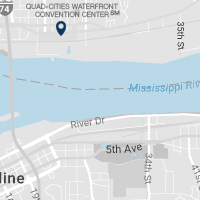 Convenient access to the Isle Casino Hotel® Bettendorf, local Quad City restaurants, shops and the Mississippi River Trail that spans over 18 miles along the riverfront. 24,000 square feet of meeting space with up to eight private meeting areas. Business center with computer stations, fax machine, photocopier, and wireless Internet access. The lobby, concourse and ballroom can be combined to accommodate up to 1,500 guests or partitioned for your smaller event needs. Ability to accommodate multiple events simultaneously. Cutting-edge technology with controls for up to 4 projection screens, microphones, and lighting. Connected to an additional 15,000 square feet of meeting space at the Isle Casino Hotel Bettendorf. The Isle Casino® Hotel Bettendorf is Iowa's largest hotel resort with over 500 suites and rooms. *as voted by the 2017 Quad City Times Reader’s Choice Awards. Our catering staff is here to serve you. We are pleased to offer you a variety of options to make your conference or corporate event memorable and effective. Hi, I'm Leah, your meeting & conference planner! I look forward to working with you for your next event. I'm eager to make your event memorable. Contact me today for a dynamic event! We would love to put together a proposal just for you. Our trained event planners are waiting to hear from you. © 2017 Eldorado Resorts, Inc. All rights reserved. Gambling a problem? There is help. And hope. Call 1-800-BETS-OFF.